only way that he could be useful to his brothers and sisters in Christ. Gerardo had a barber shop in San Giovanni Rotondo. For many years he had the honor of being Padre Pio’s barber, as well as barber for the other Capuchins. He went regularly to the monastery to cut their hair and he considered it a great privilege. As a sign of respect, he always wore a suit and tie whenever he went to the monastery to give the Capuchins a haircut. In 1939, when Bert was eight years old, Uncle Gerardo started taking him each Sunday to the afternoon Vespers service at Padre Pio’s monastery. They walked the one mile distance, since there was no public transportation to the monastery at that time. On the way, Bert and his uncle passed an occasional farmhouse nestled among cherry trees but other than that, the surrounding area was almost completely undeveloped. Sunday Vespers at the monastery, which included singing, prayers and Benediction, lasted almost one hour. Padre Pio and the other Capuchins always sat in the balcony of the church for the prayers. Very few lay people attended Vespers at the time, probably due to the fact that it was a long uphill walk from the town of San Giovanni Rotondo. After Vespers, Bert and Uncle Gerardo would go into the monastery garden and visit with Padre Pio. There were usually six or eight priests along with several laymen in attendance. A high wall surrounded the entire area, which afforded complete privacy. Past the garden entrance was the monastery’s well. Padre Pio would often hold Bert’s hand and walk down the garden pathways while the other men would follow along behind. Even though Bert was just a small boy at the time, while in Padre Pio’s presence, he felt no desire to play or run about like children often do. Padre Pio would frequently sit on a bench and converse with the adults while holding Bert’s hand. On one occasion, Padre Pio spoke about Bert’s father to everyone who was gathered. “Just like my own father, Bert’s father, Matteo, has emigrated to the United States in order to make a living,” Padre Pio said. “Many people believe that the United States is so rich that the tiles on the roofs of the homes are made out of pure gold. That is why so many people want to leave Italy and move there,” Padre Pio added. Grazio Forgione, Padre Pio’s father, had traveled to South America and also to the U.S. to work and earn money for his family and for Padre Pio’s education in the seminary. Bert recalled some of the “regulars” who visited Padre Pio during the period of recreation in the monastery garden after Sunday Vespers. There was Basilio, the town’s electrician, Michaelino, who had a newsstand where he sold tobacco and newspapers, the English Count John Telfener, who owned a villa nearby, and little Pio Abresch, the young son of the monastery’s photographer. Pio Abresch, who attended the same school as Bert, eventually became a priest and was sent to Rome to serve at the Vatican. Not to be forgotten was the monastery’s dog, a German Shepherd who was instinctively good at guarding the Capuchins’ property and keeping strangers at bay. Although Bert was too young to fully comprehend Padre Pio’s spirituality, he always knew that there was something special about him. For one thing, he always wore brown half-gloves and Bert knew that he did so in order to cover the wounds of the stigmata on his hands. Bert served as altar boy for Padre Pio on one occasion only. The Mass was very long and the Consecration was especially long. It seemed to Bert that it lasted for several hours. Kneeling on the hard marble floor was uncomfortable and making the effort to remain still during the long periods of silence, proved to be almost impossible for young Bert. The Mass took place very early in the morning and although Bert tried to stifle his yawns while serving at the altar, he did not succeed. He never signed up to serve Padre Pio’s Mass again. Bert did as instructed. He was very familiar with the monastery and knew that Padre Pio’s cell was just down the corridor. Once inside Padre Pio’s cell, Bert saw the kneeler close to his bed. There he knelt as he had been instructed. He remembered that it was common knowledge in San Giovanni Rotondo that Padre Pio was often tormented by the devil. He also knew that Padre Pio led a very penitential life. He looked around the room to see if there were any chains and there were none. As he was kneeling, he suddenly began to remember other sins that had completely slipped his mind. “I talked back to my mother,” Bert reflected. “I was disobedient to Uncle Gerardo,” he remembered. “I neglected my prayers.” Suddenly, Bert became afraid. “I have a feeling that Padre Pio already knows this,” Bert said to himself. “He can probably read my mind and know my sins even before I confess them.” Bert did not have the courage to go back to Padre Pio’s confessional to receive absolution that day. He left the monastery and went straight home. It was true enough that Padre Pio was exacting and meticulous regarding one’s conduct. 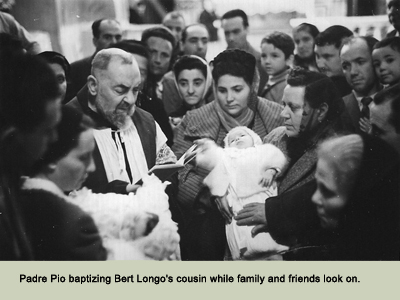 Bert Longo learned that lesson from Padre Pio at an early age. On one occasion, Padre Pio was speaking to one of his spiritual sons, Professor Enrico Medi, about the serious sin of telling lies. Medi had recently been elected to Parliament and a prosperous and successful career in politics lay ahead for him. However, in the political world, Medi felt that it was impossible to always tell the truth. Occasionally, one had to tell a lie. He expressed his opinion but Padre Pio saw no room for compromise and strongly disagreed with Enrico. “Well then, if it is wrong to tell even small lies, I must resign from my position as a member of Parliament,” Professor Medi said. Padre Pio was very happy about his decision. Bert’s Uncle Gerardo used to direct the religious plays that were performed in the hall adjacent to the church of Our Lady of Grace. On one occasion, young Bert was assigned to play the part of a mendicant Franciscan. When it was time for his entrance, he forgot the instructions he had been given. He made his way to the stage, not in a dignified manner, but running full speed. He delivered his lines quickly and ran off stage even faster. Padre Pio was in attendance for Bert’s acting debut. Seeing his ill-fated performance caused Padre Pio to laugh out loud. It was determined by the director that Bert Longo had no acting ability, and he was never cast again in any of the plays. Bert used to go to Mary Pyle’s home where everyone gathered to rehearse for the plays. There, he became acquainted with Padre Pio’s father, Grazio Maria Forgione, who lived at Mary’s house. Bert and Grazio often played “Scopa” together, a card game they both enjoyed, during the rehearsals for the plays. Grazio Forgione, a man of deep faith, was described by those who knew him as, “very simple and very good.” His kindness in his dealings with others was always evident. He was careful not to harm any living thing, not even an insect. He and his son, Padre Pio, had always been very close. When Padre Pio was a child, Grazio would take him on day pilgrimages to nearby religious shrines. They alternately walked and rode a donkey. Every year, on the feast day of St. Donato, Grazio took young Padre Pio to the fair in Pontelandolfo to buy sheep. In later years, Padre Pio would speak about the beautiful church in Pontelandolfo that he and his father visited each year on St. Donato’s feast day. After he became a priest, Padre Pio would hear his father’s confession. Grazio said that at times Padre Pio surprised him by informing him of sins which he had forgotten to confess and to which he had told no one. Grazio understood that his son had received special graces from God. Not only did he have the gift of reading hearts while hearing confessions, he also expressed intuitive knowledge in many other circumstances. When the Holy Family Capuchin monastery and church were being built in Pietrelcina, a big problem presented itself. Many times the area had been probed for water, but with no success. The builders went to San Giovanni Rotondo to discuss the problem with Padre Pio. The construction of the Holy Family monastery was a project that was very close to Padre Pio’s heart and he was anxious for its completion. He was shown a blueprint of the area where the monastery would one day stand. Padre Pio pointed to a certain spot on the blueprint. “Dig five meters in this area and you will find all the water you need,” Padre Pio said. The advice proved to be accurate. When the workers dug in the area indicated, a spring of water came forth which was so plentiful that it supplied more than enough water for the needs of the monastery. The overflow was used by the town of Pietrelcina. Many of the people who visited San Giovanni Rotondo would share their stories about Padre Pio with Grazio. One man from Pietrelcina told Grazio of his experience in Padre Pio’s confessional. The man had left Italy for a time and had moved to America. While there, he committed a terrible crime. He moved back to Italy without anyone knowing that he was the perpetrator of the crime. While making his confession to Padre Pio, he withheld his dark secret. When Padre Pio asked him if he had any other sins to confess, his answer was no. Padre Pio told him to turn around and look behind him. The man did so and saw the whole scene of the crime in miniature, reenacted before his eyes. He was filled with terror. What terrified him even more was seeing the devil standing directly behind him, ready to seize him. The man fainted. When he was revived, he again confessed his sins to Padre Pio, this time, withholding nothing. Padre Pio had received the stigmata in 1918, in the monastery church of Our Lady of Grace. When the news reached Grazio that his son had received the stigmata, he was profoundly moved. One late afternoon, when Grazio came in from doing the farm work on his small land holding, he saw that his wife Giuseppa’s eyes were red with tears. She told Grazio that she had been summoned that day by the parish priest of Pietrelcina. The priest showed Giuseppa a letter he had received from Padre Pio’s monastery in San Giovanni Rotondo. The letter was to inform him that Padre Pio had received the wounds of Christ on his hands, feet, and side. Padre Pio was the first priest in the history of the Church to receive the stigmata. When Grazio heard the news about his son, he too, cried with Giuseppa. Following the custom of kissing the hand of a priest, Grazio often tried to kiss his son’s hand, but Padre Pio would not allow it. “It is I who should be kissing your hand, father,” Padre Pio would say to Grazio. One day Grazio managed to succeed in kissing Padre Pio’s hand. “Do not worry. I am not kissing your hand, son. I am kissing the wounds of Jesus Christ,” Grazio said. His respect for his son was so great that he didn’t speak to Padre Pio using the word, “tu,” the familiar second person singular that family members use when speaking to each other. He used the more formal, “voi.” When Grazio passed away, Padre Pio was so grief-stricken that he could not resume his normal priestly duties for many days. In 1939, Padre Pio attended the dedication ceremony of one of the beautiful and early Via Croce (Stations of the Cross) that had been erected in San Giovanni Rotondo. Bert Longo and his Uncle Gerardo attended the ceremony as well. Though Bert lived in San Giovanni Rotondo for the first twenty years of his life, Padre Pio’s presence at the dedication ceremony that day was the one and only time that Bert ever saw him outside the monastery. Padre Pio was not a cloistered religious. If he had wanted to, he could have gone on outings or taken a vacation like the other Capuchins in his religious community did. But for reasons of his own, he chose not to. It was his desire and his practice to stay within the monastery walls. He spent his time either in prayer or in priestly service to those who needed his help. Bert and his Uncle Gerardo faithfully attended the Vespers service at Our Lady of Grace every Sunday afternoon for five years. Their weekly visits were curtailed due to an event that happened in San Giovanni Rotondo in February, 1944. That was the year that German soldiers placed a cannon in the center of the town and ordered all the citizens to turn in their hunting rifles, pistols and automobiles. There were only about four automobiles at that time in San Giovanni Rotondo. The cars were taken to the Umbrian Forest and hidden among the trees but the German soldiers soon found them and destroyed them. After that, everyone became more concerned for their safety. For that reason, Uncle Gerardo stopped taking Bert to the monastery for Vespers. Bert’s high school class in San Giovanni Rotondo consisted of fourteen students. When graduation approached, Bert began to think seriously about his vocation. He had been accepted at the University of Bari but could not decide between medicine or engineering as a career path. He asked Padre Pio for his opinion on which would be a better choice. “Why don’t you go on a retreat and pray about it?” Padre Pio said to him. Bert was a teenager at the time and going away on a retreat for the weekend did not seem feasible. However, he decided to go alone to Monte Calvo, the large mountain that was directly behind the monastery. He spent time there in seclusion as he walked and prayed, asking God to help him with the important decision regarding his future. Afterward, Bert felt that he should choose engineering over medicine. It proved to be an excellent decision. Later, when he thought about his conversations with Padre Pio, he reflected that Padre Pio never told him what to do. Instead, he always suggested that he pray and ask the Lord to guide him. Bert’s father, Matteo Longo, had been working in the United States for many years to help support the family. In 1951, twenty-year-old Bert, along with his mother and brother, moved to the United States to be reunited with Matteo. Before they left San Giovanni Rotondo, the family wanted to see Padre Pio one last time. Uncle Gerardo arranged for them to meet Padre Pio at a side area of the church to say good-bye and to receive his blessing. It had to be done discretely and almost in secret, since there were so many people who were constantly trying to see Padre Pio. After Bert relocated to Massachusetts, he kept in touch with Uncle Gerardo and Padre Pio through letters. 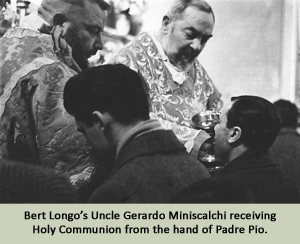 When Bert needed Padre Pio’s counsel, he would write to his Uncle Gerardo and ask him to relay the message to Padre Pio. Bert became interested in an Irish girl and started dating her. He wrote to Uncle Gerardo and asked him to tell Padre Pio the news. Padre Pio gave Uncle Gerardo a message to pass on to Bert. “Does the girl come from a religious family? Does she go to Mass on Sunday?” Bert reflected on Padre Pio’s words and could not answer in the affirmative. He decided to stop dating the girl. He became interested in a second girl and started dating her. He thought about Padre Pio’s comment, “Is her family religious? Does she go to church?” Again, he could not reply in the affirmative. He stopped seeing the second girl. Bert served as an usher every Sunday morning at St. Anna’s parish in Leominster, Massachusetts. One of the parishioners was a very nice Italian girl named Clara DiNardo. Bert used to usher Clara to her seat for the Sunday morning Mass. Soon they started dating. He wrote to Uncle Gerardo and told him to pass the news on to Padre Pio that he was dating Clara. A short time later, Uncle Gerardo wrote back. Padre Pio told Uncle Gerardo to tell Bert that it sounded like Clara came from a good Italian family and it sounded like a good match. And indeed it was! After Bert and Clara got married, Uncle Gerardo would come to visit them and would stay for long periods of time. 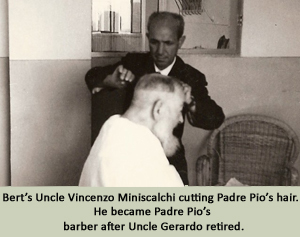 By that time he had retired, and his brother, Vincenzo had assumed the privileged task of cutting Padre Pio’s hair. Uncle Gerardo still attended church twice each day and gave much of his time to prayer and spiritual reading. Knowing the great esteem that Bert had for Padre Pio, Uncle Gerardo gave him several precious relics. From his days as Padre Pio’s barber, he saved some of Padre Pio’s hair and gave it to Bert. 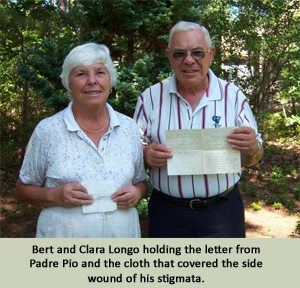 Bert also received a piece of bloodstained linen that covered Padre Pio’s side wound, sent to him from San Giovanni Rotondo by Padre Pio’s personal assistant. Bert and Clara felt blessed by the visits of Uncle Gerardo to their home. “Why don’t you decide to live here permanently?” Bert asked his uncle on one occasion. “No, I want to die poor, like Saint Francis of Assisi,” he replied. Gerardo moved back to San Giovanni Rotondo and died in 1987 on the auspicious day of October 4. It was the Feast of Saint Francis of Assisi. Nobody who knew Gerardo Miniscalchi was surprised. I am very happy to hear that your health is good and from the depth of my heart I am happy when your Uncle Gerardo tells me the current news about you. With love, I remember you in my prayers to the good Lord so that he can bless and help you with the abundance of his grace. I am sending you my paternal blessing with all good wishes. I advise you to always act in the way of a good Christian. Always remember the good instructions you received from your parents. Stay away from the dangerous company of false friends who break both your mind and your heart. Always obey your loved ones and be sure to see to your studies. These paternal recommendations come from my heart and I desire that they enter your heart. I embrace you and I bless you.